Organization: 1 Net, Goal Keeper and 3 lines of players divided equally with balls at each line. A) Dribble, faint and strike on goal. Player in line (A) then turn to play a "Give and Go" with player from B. 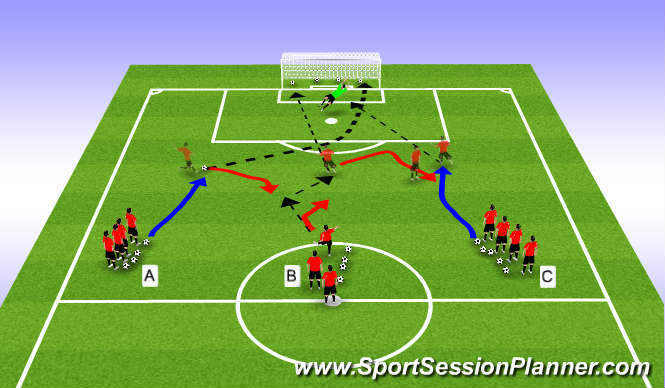 Once B strikes on goal he/she turns to go into a "1v1" with the player from line C. Players rotate from line A to B, B to C, C to A. Progression: A + C vs B for a 2 v 1. Coachign Points: Realistic game speed movement and faints, Quick shot release after faint. Accuracy before power, part of foot/part of ball, Head steady and be attacking minded.